EzGreensboro News & Record. EzGreensboro.com: $832,000 Payoff; "Buffalo Public Schools award the contract to Say Yes for community program"
$832,000 Payoff; "Buffalo Public Schools award the contract to Say Yes for community program"
"The Buffalo Public Schools will turn to a familiar partner to help pull off the district’s new community schools program beginning in September. The Board of Education on Tuesday awarded Say Yes Buffalo the contract to manage the community schools project, which will include the hiring of 12 new staff members at a cost of $832,000. The money will come from the $12.5 million that the district received in state money to introduce the community school model at 13 city schools, where more “wraparound” services will be offered to students and their parents. That will include after-school and Saturday programs; tutoring and mentoring; adult education; and services for the neediest students. Say Yes was one of three organizations to bid for the contract and was chosen based on the related work it already does in the district, officials said. Besides providing college scholarships to graduating students, Say Yes offers summer enrichment programs, mental health clinics and legal services at city schools. However, board members Theresa A. Harris-Tigg, Patricia A. Pierce and Paulette Woods all raised questions about the contract. Harris-Tigg, in particular, was concerned about giving over too much control to Say Yes. Superintendent Kriner Cash said he’s grateful for the assistance from Say Yes, because the district doesn’t have the staff to coordinate all the activities within the new community schools. 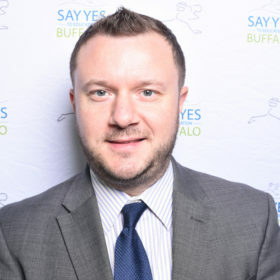 David P. Rust, executive director of Say Yes Buffalo, said that this is the first time the nonprofit has submitted a request to do this type of work and it will end up paying about $40,000 out of its own pocket for in-kind services, equipment and training. ...Say Yes will end up hiring a project manager to oversee the community school program at a cost of $107,000; two zone leaders for a total of $149,000; and nine community school facilitators for a total cost of $576,000. Who runs Say Yes Guilford? WEDNESDAY, JULY 29TH 2015; "The Say Yes to Education program has closed its Syracuse office"
"According to the mayor's office, the job of Operating Director held by former Syracuse Parks Commissioner Pat Driscoll, has also been eliminated. "Prior to officially joining the Say Yes Buffalo team Betsy played a key role in the launch of the initiative in 2011, in her previous capacity as communications director for the Community Foundation for Greater Buffalo"
To contact the operating committee, email guilford@sayyestoeducation.org. Contact Say Yes staff by calling 336-814-2233 or via email at guilford@sayyestoeducation.org.